For over forty years, Annabel Trends have been making quality home linen, kitchen napery and accessories loved by people Australia wide. Their Australian-designed products are made with care and will look wonderful in your home – so it was only a matter of time until they created a range especially for the home, known simply as At Home! Many things define a home, just as many things define you! 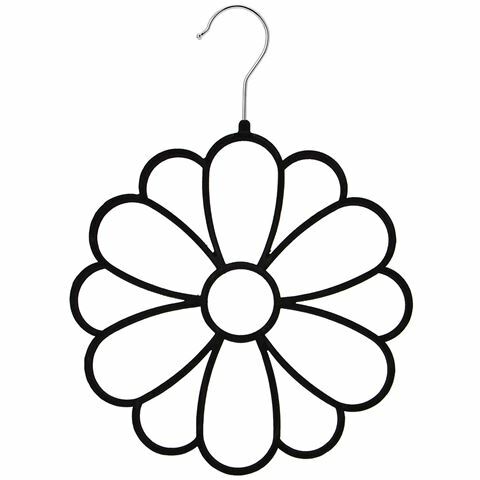 So keep those things tidy on an Annabel Trends Accessory Hanger. In two designs – a Daisy, and a simple Oval – they’re a smart way to organise accessories such as scarves, belts and jewellery. And the real reason you’ll want one of these Accessory Hangers hanging around? They’re covered in a soft layer of velvet, which prevents slippery items such as silk scarves and chains from falling to the bottom of your wardrobe! Your home need not be complicated, so it’s time we welcomed At Home’s simple designs through the door! Strong steel frame in a layer of velvet. Velvet surface keeps accessories from slipping from the hanger. Great for scarves, belts, ties, jewellery and more. Dimensions: 27 x 27cm (excluding hook).